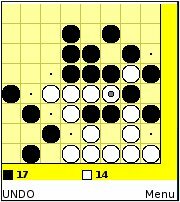 The best mobile Java version of the classic Reversi (also called Othello) board game I’ve seen. The object of the game is to capture your opponent’s white pieces between two of your pieces. Captured white pieces change to black. The game ends when neither play can move. The player with the most pieces wins. This version supports touchscreen and non-touchscreen phones. It has six difficulty levels, undo move, game rules and valid move indicators. It’s ad-free and doesn’t require a data connection or use any data. The Asha 201 supports Java ME so most of the games here should work. Can i dwnlod it 2 my mobile nokia 2700?nd how much it cost? can i download diz games to my phone..? i thougt its free. Why can’t i dload it for free? The apps are free, your operator may charge you for the data used to download them. Works on the LG 840g.